The Rock Bottom Restaurant & Brewery is the place where food, beer, great service and a convivial atmosphere all come together for the ideal gathering spot with friends and family. Fun is always on tap when you hit Rock Bottom with Pint Nights and rockin’ Happy Hours. Each location is home to a friendly atmosphere and most locations offer Banquet Facilities perfect for any occasion. 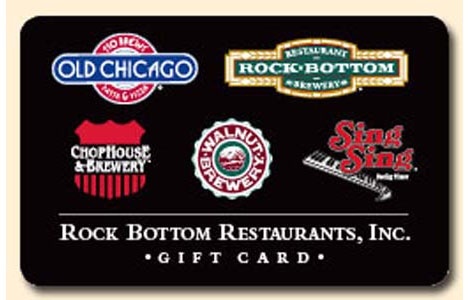 Redeemable for food, beverage and merchandise at locations owned by Rock Bottom Restaurants, Inc. and its Franchises: Walnut Brewery, Rock Bottom, Sing Sing Dueling Pianos, Old Chicago, and Chop House & Brewery. No expiration date. Lost or stolen cards will not be replaced. For locations or for gift card balances visit their website at www.rockbottomrestaurantsinc.com.